Pant is a research assistant and doctoral candidate in bioengineering at the University of Georgia. He has already published nine papers in peer-reviewed journals and holds three patents on biomedical technology with applications pending in the U.S. trademark office. Pant keeps a fast pace yet chooses to live deliberately and joyfully. Ramanagar, Nainital, India, is small by Indian standards, with a population of 42,000. Nainital, a tourist destination with a picturesque lake, is nestled at the base of the Himalayas. Here, Jitendra Pant’s parents nudged their children toward higher education. The Pants are Kumaoni, a sect including the Brahmins, and one associated with educational achievement. One of the Pant daughters became a neuroscientist, another works in fashion and a third is a lecturer in English literature. Jitendra, best known as Jiten to his friends, is the youngest. Naturally outgoing, with a particular fondness for performance and singing, he settled upon a life as a scientist. Pant completed an undergraduate degree in technology and biotechnology at ICFAI University Dehradun, India, in 2010, and worked in research and development for three years at Biocon Research Ltd, a biopharmaceutical giant. (“Ranked number one in the entirety of Asia, and the top 20 in the world,” he says.) Pant was working on a graduate degree in engineering with specialization in biotechnology from BITS-Pilani University when he applied to UGA to study bioengineering. In January 2015 he joined the Handa Research Group in the School of Engineering to study under Hitesh Handa. Two years into his doctoral program, he has published research in nine journals, presented papers at three international conferences, and is named on three patents. 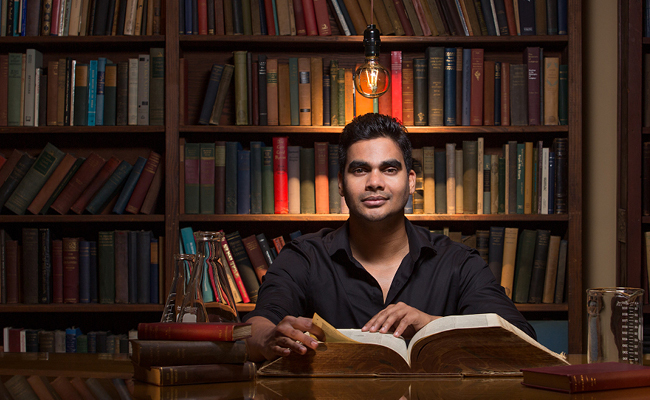 Pants’ principal investigator and the lab’s namesake is Hitesh Handa. Handa works in translational research for development of medical device coatings. Translational research, as Pant explains, underscores invention with practical urgency. “It is to bring things to the market as soon as possible. The work is to see if it is going to work for people.” An example is Handa’s development of biomaterials designed to prevent thrombosis and infection, with potential for medical device applications. “With his experience in biomolecular interactions (atomic force microscope), materials/surface science, polymeric coatings, blood-surface interactions and animal models, his (Handa’s) goal is to bridge the gap between the engineers and clinical researchers,” according to the lab’s website. Atomic force microscope, or AFM, allows for the mapping of a surface at a nanoparticle level. 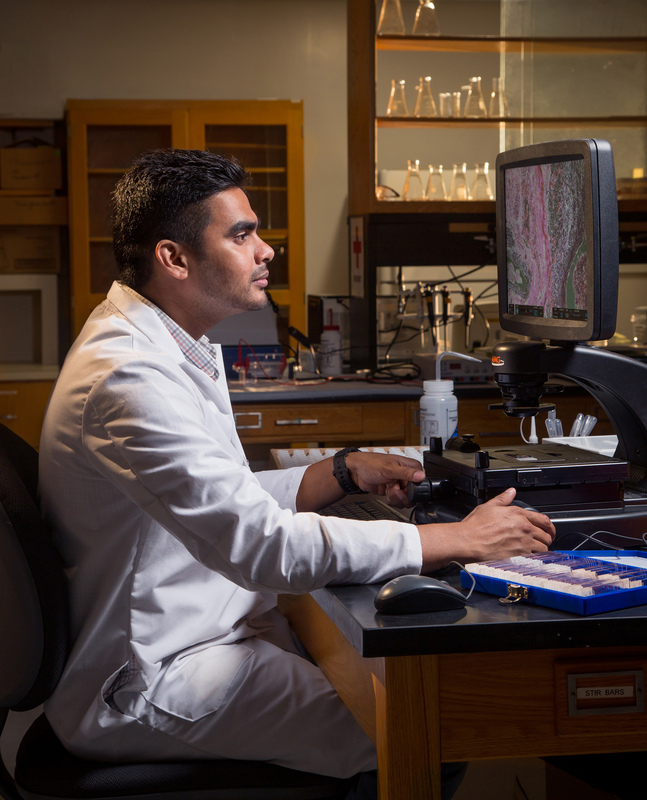 Pant describes a variety of biomedical devices, coatings and biocompatible products that Handa’s lab research and develop. Wound dressings which cause an instant blood clot and thus prevent excessive bleeding, are one. Bio-engineered skin is another. When not in the lab, Pant divides his time between creative pursuits, dancing, singing, or working on self-realization. Pant believes discipline and motivation are just as important as intelligence in reaching one’s highest potential. He reads biographies of famous people and studies the spiritual traditions of the world, and is now reading the Essential Wisdom of the Bhagavad Gita. So when shaving accidents happen, has Pant tried slapping some on that razor nick? He laughs. No, he hasn’t tried that. Does this also mean that he is a diligent label reader? He studied endocrine disrupters while in India. Common food and beverage containers may be culprits, such as water bottles, Pant says. “So when you are drinking this water, you are drinking the chemicals that the bottle leaches too.” He recommends using metallic or glass containers. Yet, if harmful substances can leach, there is a flip side as well, as Pant observed back home. Copper and zinc tea pots, commonly used in India, are known to have positive effect upon drinking water. Called “Indian brass” this combination is inherently anti-bacterial. When using the copper and nitric oxide polymers, “You have to use them in Nano quantities on a Nano scale; it can harm you in high dosages,” Pant cautions. “When we used copper in our material, we used concentrations lower than the allowable quantity,” he says. They did testing on mammalian fibroblast cells, ensuring safety before taking it to market. Also in testing stages is an alternative to antibiotics. Products under development are exhaustively tested for efficacy and safety. “I want to walk the talk,” Pant says. “I left my job in a pharmaceutical company because I wanted to get my PhD… I want to make a difference.” The public benefits from different research perspectives and inter-disciplinary approaches. In Pant’s perspective, to be successful requires focus. For the first year and a half after arriving at UGA, Pant did not take a single day off. “I worked like crazy,” he admits. “And I sometimes left the lab at 1:00 or 2:00 a.m. I did nothing but work.” More recently, he began to rise at 5:00 a.m. He did this to be more disciplined and accomplish more. Pant’s industry has paid off. Last April, He competed in 3MT, or the Three Minute Thesis, at Cine Theater in Athens. Condensing his work into three minutes and one static slide, he presented on one of his lab’s projects: the creation of artificial skin to aid burn victims. “1.1 million people in the U.S. alone are serious burn victims,” Pant explained. “Not everyone can bear the cost of plastic surgery.” Bio-engineered artificial skin would not only benefit patient healing but potentially prevent disfigurement, even without the aid of plastic surgery. The audience included 27 of Pant’s friends, eight from the Student Toastmasters chapter, cheering for him. (“I think people here are very, very nice,” Pant confessed later.) The Three Minute Thesis was where their friend, Jiten, would put to test what they were mutually learning, but with unusually stiff pressures. Pant had begun attending Toastmasters in order to hone his speaking skills four months earlier, all in hopes of winning the Toastmasters International World Champion of Speaking title. (“One day,” he emails later. “In the long run, I want to be a successful leadership and life coach.”) It stood him in good stead as preparation for the 3MT. The Toastmasters group met on Mondays at 5:30 p.m. weekly for an hour and a half of public speaking practice and rehearsals at the Miller Learning Center. In typical fashion, Pant wanted to leave nothing to chance. As the judges weighed in on April 8th after the 3MT, the contestants and their guests gathered at an after-reception inside the theater. As usual, it was an impressive group of graduate students and the judges were to single out only two winners. He won an unofficial third place in the competition. If Pant was disappointed to learn that evening that he did not win first place in the competition, it did not show. As his girlfriend and friends enthusiastically clapped him on the back afterward, Pant smiled. He had already earned fellow Toastmasters highest praise: during his speech he had used no filler words, no awkward “ums” nor “ahs” (all of which are discouraged by Toastmasters) and never once did he stumble. Pant dove into self-awareness and self-actualization with gusto, learning to shoot pool and read novels simply for pleasure. He posts his singing performances, like one recorded in Helen, Ga., on YouTube. The path is open; at age 28, Pant has world enough, and time. This story originally appeared in UGA Graduate, the magazine of the University of Georgia Graduate School.